Most acute tonsil infections are caused by viruses or bacteria, and usually are contagious (transmitted) by direct person-to-person contact. Tonsillitis caused by a virus infection usually is contagious for about 7-10 days. Tonsillitis caused by bacteria and with treated antibiotics are considered non-contagious after approximately 24-48 hours antibiotic therapy. Sinus infection (sinusitis) symptoms can include headaches, a sore throat, and toothaches. Antibiotics and home remedies can relieve sinus infection symptoms. 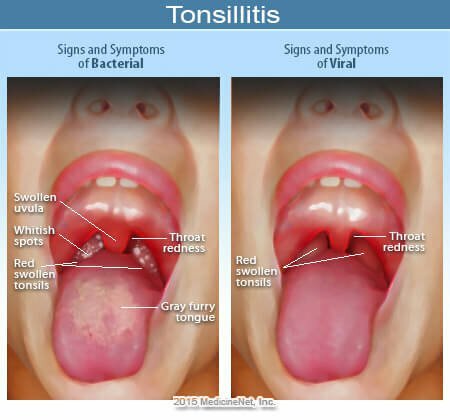 What were the signs and symptoms associated with your tonsillitis? What kinds of tests or exams led to a diagnosis of tonsillitis? Did you have recurrent infections? Please share your experience with tonsillitis or adenoid infection. 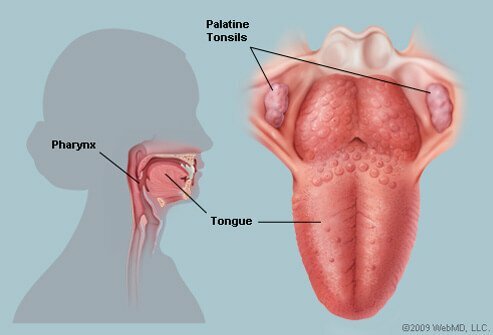 If known, what is/was the cause of your tonsillitis? Adenoidectomy is a surgical proceedure that often accompanies tonsillectomy. The adenoids are a mass of lymphoid tissue located behind the nasal passages. When infected, adenoids can cause snoring, sleep apnea and other problems. Here we describe the pediatric adenoidectomy procedure, recovery from adenoidectomy, and cover common adenoidectomy side effects.